In April 1972, I was appointed to a position in the National Hospital Organization Fukuyama Medical Center (formerly, National Fukuyama Hospital) in Fukuyama City, Hiroshima Prefecture. I was appointed for the purpose of establishing a Department of Neurosurgery in National Fukuyama Hospital. In the period following my appointment, not many evaluations or operations were performed. 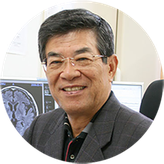 The Director of the hospital, Dr. Toshiyuki Nakamura, noticed that I had plenty of free time and asked me to start looking after patients with epilepsy. Soon afterward, I opened an epilepsy outpatient clinic at the hospital. At the time, the main antiepileptic drugs were Aleviatin (phenytoin), Phenobarbital (phenobarbital), Primidone (primidone), and Tegretol (carbamazepine). The head of the Department of Psychiatry at the time was Dr. Hideyuki Miyaji. Occasionally, when he was occupied or unavailable, he would ask me to see his patients in the psychiatric outpatient clinic. It was in this clinic that I first encountered the antidepressants Tryptanol (amitriptyline) and Noritren (nortriptyline). The name "cephalic hypersensitivity syndrome" did not exist when I first started offering headache outpatient clinics, and it is yet to be established even today. Cephalic hypersensitivity syndrome represents the aggravation of indefinite complaints to the point at which it impedes everyday activities. The symptoms of indefinite complaints include headache, stiff shoulders, dizziness / vertigo, back pain, feeling lethargic, inability to sleep, numbness and pain at different points around the body, and fatigue that never seems to go away. These symptoms fluctuate and change, intensifying and subsiding with the fickleness of the weather. As these complaints are mostly subjective, and objective findings are few, they are rarely regarded under the umbrella of a single condition, and even if full medical examinations and tests are performed, it is difficult to identify findings or causes that may underlie these symptoms. Thus, there is no reliable method of treatment. Anti-anxiety drugs and tranquilizers can be administered to treat the symptoms, but as most patients do not improve, they end up going doctor-shopping. In the process, medical institutions stop taking them seriously, and they become so-called "healthcare refugees," indefinite complaints patients with no medical home. Cephalic hypersensitivity syndrome represents the aggravation of indefinite complaints to the point at which it interferes with work and everyday life. Based on my 40 years of experience as a physician in headache outpatient clinics, I hope that the patients who suffer from chronic headache become aware of cephalic hypersensitivity syndrome as an illness. Many patients who complain of chronic headache come to headache clinics for treatment despite also suffering from a wide range of other indefinite complaints, and their complaints are often complex. It is not uncommon for headache specialists to encounter patients whose complaints they do not fully understand. It pains me when I meet patients who have gone to a headache clinic in good faith, only to be given inappropriate treatment that makes their illness even more complex. As a warning against treatment-by-numbers following the diagnostic guidelines put out by medical associations, I would like to tell patients that it is not a good idea to blindly trust a sign that says "Headache Clinic" based only on a specialist certification. What makes me so uncomfortable with the label "headache specialist" is the gap between the International Classification of Headache Disorders (ICHD), which so many specialists believe should be followed, and my clinical experience. Once a doctor is used to this system, conditions that do not fit it neatly are regarded as "exceptions," with the risk that they may not be treated properly even if they are actually curable. One issue is that young doctors who blindly trust the ICHD view illness through the lens of this classification rather than looking at the patient in front of them. For example, it has been well known for many years that migraine and tension headache are not easily distinguishable in clinical practice, with many patients suffering from a mixture of the two. Many doctors who run headache outpatient clinics tend to believe that migraine and tension headache are treated in different ways. Transformed intractable headache should be treated as cephalic hypersensitivity syndrome.